£100,000 of Various diameters, fully Telescoped to meet our clients Specification, allowing a reduction in wagons from 11 to 7. 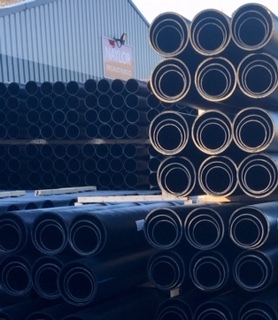 We manufacture Polyethylene Pipes in HDPE, LDPE, MDPE, ABS, PP ,Flex PVC, EVA and HIPS in coils and straights, smooth or corrugated, ranging is sizes 2mm through to 250mm. For use in a wide range of applications: ducting, conduits, drainage, Street lighting, Landfill Gas and Leachate, Rail, low pressure applications. Need a specific print line or colour?. Not a problem. If you are looking for an alternative supplier or in need of something a little more specialist then please contact Naylor Specialist Plastic on 0121 522 0290 and ask for Dave Jenkinson or John Whitehouse.